Wish you could send a text message in ALL CAPS? Can’t find the em dash key? Tired of your iPhone or iPad constantly fixing your typing, even when it doesn’t need to be fixed? 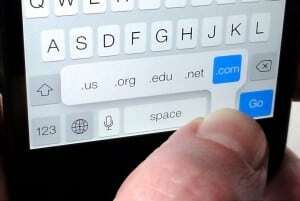 Read on for eight iOS typing tips you need to know. Sending a text message or an email IN ALL CAPS is usually considered yelling—but hey, sometimes yelling is called for, right? And even if you’re not in a yelling mood, you might need something ASAP, or maybe you’re just LOL. Just double-tap the Shift key to enable All Caps mode. 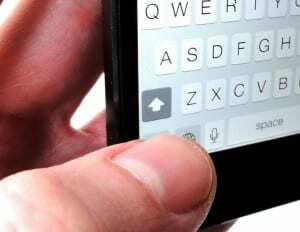 Here’s the trick to turning on caps lock on the iPhone: just double-tap the shift key. When the key turns dark gray, the caps lock is on; tap it again to turn caps lock off. Had enough of those little pop-up bubbles that correct your misspellings, abbreviations, proper names, or anything else you don’t want corrected? You can always tap the bubble to dismiss it, or you can simply deactivate the iPhone’s auto-correct feature altogether. While you’re at it, you can also keep the iPhone from capitalizing the first word of each new sentence by switching off “Auto-Capitalization,” or have it quit checking your spelling by turning off the “Check Spelling” setting. Can’t find your favorite symbol on the iPhone keypad? Maybe it’s just hidden. Tapping and holding a specific key (or a “long-press,” as it’s often called) will sometimes reveal a series of additional keys. Who doesn’t love an em dash? 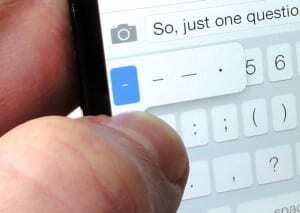 For example, while typing the body of a message, you can find the em dash (“—”) by jumping to the symbols keyboard (press the “123″ key) and pressing and holding the dash key. Within a second or so, the pop-up “-” will expand with more options, including an em dash, a mid-size dash, and a bullet. Slide your fingertip up to the button you want, then release. Presto! Press and hold the period, and you’ll get a pop-up for an ellipsis (“…”). Tap and hold the exclamation or question marks for their inverted versions (“¡” and “¿”). And for a variety of “curly” quotes, tap and hold the quote key. Keep long-pressing other keys, and you’ll find even more options. When you’re tapping an Internet or email address into the iPhone’s browser or the “To:” line of an email message, you don’t have to type in “.com,” “.net,” or “.org” every time. Don’t want to type “.com” over and over in Safari? Just long-press the period key. Instead, just tap and hold the period key (or the “.com” key when you’re using the web browser), and a pop-up will appear with all manner of dot-somethings. Hint: Want to select “.com”? Since .com is selected by default in the “dot-something” pop-up, you can just long-press the period key, then release. Tired of typing out your street address over and over, or wish there was a quicker way to ask your instant messaging buddies if they’re around? You can create keyboard shortcuts that will replace a few letters with full words or even entire phrases—perfect for, say, quickly tapping “ut” for “You there?” or “myadd” for your home address. Tap Settings, General, Keyboard, and then scroll down to the Shortcuts section. Want step-by-step instructions? Just click here. Want to add a smiley, a frowny face, or a pout to your messages, all without having to remember and type out a bunch of colons, dashes, and parentheses? When a simple “:-)” isn’t enough, there’s always the iOS emoji keyboard. All you have to do is dive into the iPhone’s international keyboard settings and add the “Emoji” keyboard. Tap Settings, General, Keyboard, then tap Keyboards on the next screen. You should see a list of all the virtual keyboards supported on the iPhone, along with an “Add New Keyboard” button; go ahead and tap that last button. 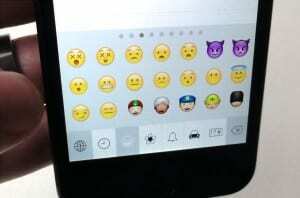 Scroll down the long list of keyboards until you find “Emoji,” then tap it. Now, close the Settings app, go back to your Messages or Mail app, and begin composing a new message. In the bottom-left corner of the keyboard, you’ll see a key with a globe icon stamped on it; tap that key. Your default keyboard will disappear, and in its place you’ll see a bunch of emoticons and emoji; swipe the keyboard, and you’ll find more. For even more choices, tap the tabs at the bottom of the screen. Ready to go back to your regular keyboard? Just tap the globe key again. Having a hard time typing on your iPad? Try this: tap, hold and drag the keyboard apart. Wish it were easier to type on your iPad while holding it in both hands? You can try, sure, but good luck stretching your thumbs across the screen. Here’s a nifty trick, though: if you tap and hold either side of the keyboard and pull your fingers apart, the keyboard will split in two. 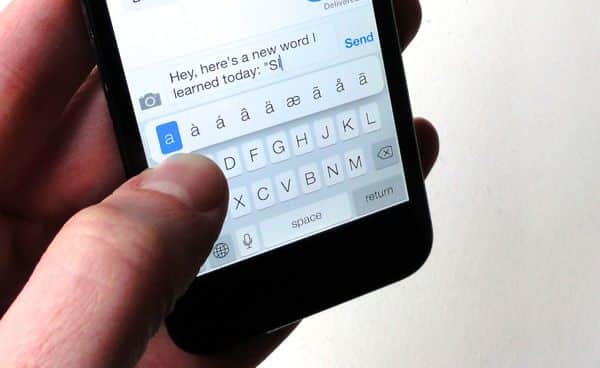 Yep, you can type letters with accents—everything from acute (“á”) and grave (“à”) accents to umlauts (“ä”) and tildes (“ã”). Just tap and hold the letter you want to add an accent to; in a moment or two, a pop-up with a range of accent marks will appear. Slide your fingertip to the accent you want, then release. Looking for more iOS tips? Click here!